Welcome to E Evans Associates Inc. Doors and Windows, Wall Systems. Transparent glass providing architectural safety and fire resistant capabilities. Sheet size and thickness varies by product. General Glass Company has a long standing history in the Northwest Glass market. It began in the early 1960s under the name of Interior Glass specializing in building and installing shower doors, mirrors and bathroom fixtures throughout Oregon and Southwest Washington. GGI offers fire-rated products from the world’s leading glass manufacturers – AGC, Schott, Pyroguard, and Central Glass. Their products fully comply with every standard required by model International Building Codes (IBC). For containment of smoke and flames, GGI offers the full spectrum of fire-protective options from 20 to 180 minutes. And for greater protection from smoke, flames, plus radiant heat: fire-resistive glass, framing, and doors. 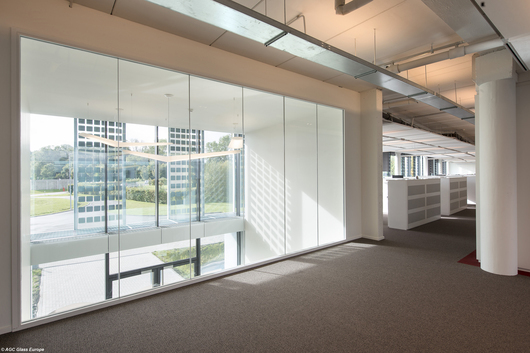 Pyrobel, PyroFrames, and PyroDoors can be combined into fire-resistive transparent wall assemblies, keeping building interiors filled with natural light while providing occupants with safety and security. PYRAN Platinum glass ceramic offers the neutral clarity of non-rated glass with the assurance of restricting the spread of smoke and flames. Pyroguard is the best option for a 20-minute laminated glass that can be cut to most any size and shape. GGI’s new wire offers the impact safety required by today’s wired glass standards. Fully tested assemblies for maximum safety. Complete selection of fire-rated glass options. The most advanced multi-laminated glass technology. High-performance metal finishes for lifetime durability. All products can be fabricated for nationwide delivery. Case distribution available for all fire-protective products.